For over 30 years, Mary Lou Ferbert prowled Cleveland’s Flats, finding inspiration for her paintings in that “throbbing heart of the city that once was a power engine of the industrial revolution” [from her Artist’s Statement]. As the Flats changed, her work did as well. 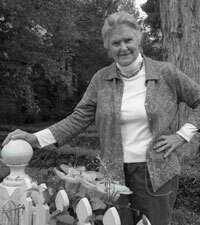 In 1985 she began her “Urban Botany Series” which focused on wildflowers that adapt and survive in an often hostile, biologically-sterile cityscape. Recently, she has embarked on a new series of large paintings that present these innovative wildflowers in a scale commensurate with their strength, survival capacities…and their beauty. These paintings comprise her “Hero Series”. In 2001, she had a solo exhibition at The Bonfoey Company entitled Heroic Urban Wildflowers. Images from the show are included in an article with the same title in Watercolor Magazine (Winter 2002 Issue). Ferbert has had solo exhibitions at The Bonfoey Company, Cleveland, Ohio (2001, 1994, 1989, 1981), Bennett Galleries, Knoxville, Tennessee (1997), the Butler Institute of American Art, Youngstown, Ohio (1993-1994), Gallery Madison 90, New York City (1987) and others. She received the Walker Memorial Award in The National Association of Women Artists 112th Annual Exhibition in June, 2001 at the Elizabeth Foundation for the Arts, New York, NY. Her work can be found in the collections of the Cleveland Museum of Natural History, El Paso Museum of Art, The National Museum of Women in the Arts, Rutgers University, and many others.